Akanishi, the former lead singer of the hugely popular Japanese idol band Kat-Tun, released his debut U.S. solo album, “Japonicana,” on March 6. Several tracks on the album were produced by the Grammy Award-nominated trio the Stereotypes, who have produced hit songs for acts such as Far East Movement and Ne-Yo. 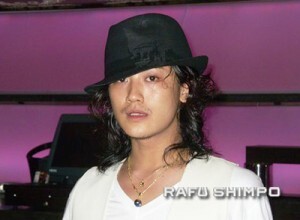 With Kat-Tun, Akanishi was part of an entertainment juggernaut that established numerous sales records in Japan. Their 11 singles, four albums, and seven DVDs all reached No. 1 on the national charts. In 2009, Kat-Tun became the first artists ever to perform 10 consecutive days at Tokyo Dome Stadium, one of the largest and most prestigious venues in Japan. The week’s performance follows three successful shows last year at Club Nokia. A near riot broke out at a 2005 Los Angeles appearance by Kat-Tun. What was the event in which the group was participating? Hint: The answer to the trivia question can be found at www.rafu.com. Hello. I am really happy that I’ve come across this article. I wanted to see the show but I don’t have the tickets. I really want to be there to support him. Please let me go see it. I am a BIG fan of Jin and i would love to be able to go to his concert! This article is a joke, right?